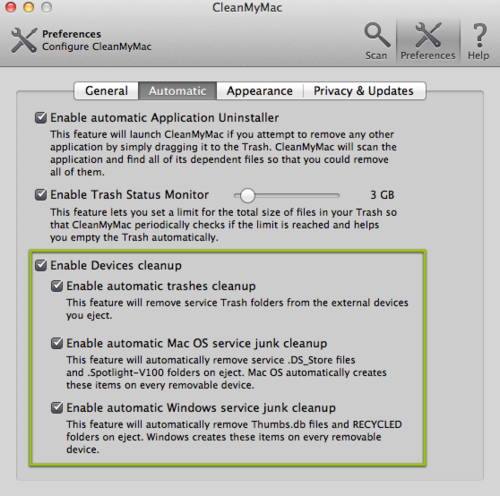 We’ve talked a lot about our web activities lately and now it’s time to speak about CleanMyMac. You can enable only those types of modules that you need when scanning. Just uncheck the unnecessary modules. Also, if you want only one module to rescan your hard drive, choose it and click the little button in the right bottom corner of the screen. Switching between Scan, Preferences and Help windows is also possible via hotkeys Command+1, Command+2, Command+3. You can drag and drop files on CleanMyMac icon and the app will offer you to quickly slim it, erase, uninstall or clean system junk related to it. CleanMyMac remembers all the files (and modules) you have unchecked from cleaning earlier. This allows to clean your Mac excluding the files you think are necessary for you. If you found the particular file in scanning results and want it to be excluded from scanning and cleaning by CleanMyMac, just click it and press “Backspace”. This gives 100% guarantee that CleanMyMac won’t be able to find and thus clean this file anymore. The new Search feature in CleanMyMac 1.10.0 allows to find the particular files and clean them solely in a blink of an eye by clicking “Clean”. Hit Cmd+F to search the files. While you may find only a couple of files you would like to uncheck and exclude from scanning, sometimes there can be dozens of such files. Press Option and click any one of them to check or uncheck them all. CleanMymac is able to clean flash drives and other external devices from useless and annoying service files generated by Mac OS X and Windows. The procedure is performed automatically along with a system scan if the corresponding feature is enabled in Preferences and the external device is connected to your Mac. When you delete files on your flash drive via Finder, they are being removed to the Trash on the same drive. Sooner or later Trash takes all the free space, while you think you have been physically removing all the unnecessary files. 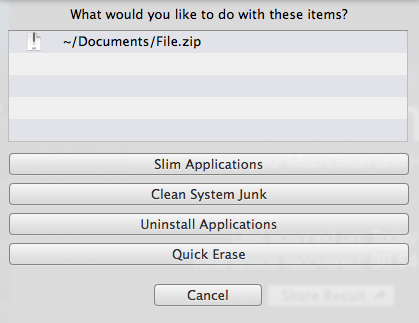 To avoid that use CleanMyMac’s Quick Erase instead of usual file deletion. We have a few even more advanced tips on using CleanMyMac for you, but we will tell about them a bit later, so stay tuned by subscribing to our blog!